September short breaks are perfect for a UK getaway. The weather in the south over recent years offers the perfect opportunity to escape for a few days by the coast or in one of the UK’s fabulous cities. For unusual short break ideas, whether you choose a cultured city break or a relaxing coastal escape we think staying on a boat will give you an unrivalled experience. If you are looking to escape for more guaranteed sunshine then a short break to a mediterranean destination might be another consideration. In an earlier post we highlighted our top locations for staying on a boat in Europe. However, with so much that the UK has to offer, and the premise of some warm weather, we think a short break in the UK is certainly one to be considered. September short breaks can be fantastic, it’s a great time of year for UK short breaks. With the school holidays coming to an end, the crowds reduce leaving you with plenty to explore. Alternatively, if relaxation is what you are after, time and space is more readily yours. September is also a time of tradition, of harvest, and you can take advantage of many areas celebrating with festivals, foodie-themed weekends and events. Discover miles and miles of coastal walks, cycle paths, beaches, national parks, historic landmarks and traditional country villages with accommodation in Hampshire and the Isle of Wight. Stay on a boat in Southampton for a unique city break with direct access to the isle of wight or choose a boat in Lymington to explore the New Forest and all that this area has to offer. You can also check out our other blogs on why Lymington offers a “unique place to stay” when visiting the area and our “Top 5 reasons to visit the New Forest”. Accommodation in Poole offers the ideal place to stay for exploring Europe’s largest natural harbour. The area boasts some of Britain’s best beaches, England’s first Natural world heritage site and a host of attractions. Staying on a boat in Poole will give you stunning views of the harbour and serve as the perfect base to discover the area’s rich heritage and geography. Discover more about what to see and do in Poole in our previous blog post. London undoubtedly offers the most comprehensive city break destination in the UK. A visit to this diverse and exciting city will inevitably include some of the world’s best attractions, restaurants, cultural and historic landmarks. With accommodation in London at a premium, both in terms of price and availability, staying on a boat represents an affordable and unusual place to stay. Search for your boat today, whether you are looking for a romantic city break or an activity packed short break there will be an option to suit all budgets. Often thought of as two of England’s best loved counties, Devon and Cornwall offer a contemporary feel as well as charm and tradition in abundance. Glorious beaches, quaint country pubs, award winning restaurants combine with the great outdoors to give a short break suitable for active types as well as those looking for a romantic getaway. 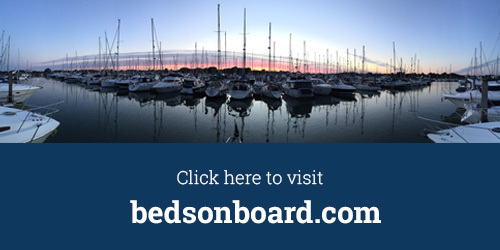 Of course, for an unusual break idea Beds on Board gives you the chance to stay on a beautiful boat amidst the stunning backdrop of the area’s marina’s and coastline. Search our listings to find your next west country getaway. Marinas are unique places to stay and are often in close proximity to some of the best locations in the UK for short breaks. Whether you are looking for a relaxing getaway or for a base to explore the landscapes, history, culture and cuisine of a particular destination, staying on a boat will be the perfect compliment to your experience. Sign up to Beds on Board and start searching for an alternative accommodation option for your next short break today. Can’t find your favourite short break location in the South? Let us know and we will be sure to include in a future post.